The crowd favorite Toot Sweet birds are back with a little addition to the family! Bright spring colors, and whimsical touches make this a must add to your Toot Sweet series collection. Gorgeous sunset over a lavender field. 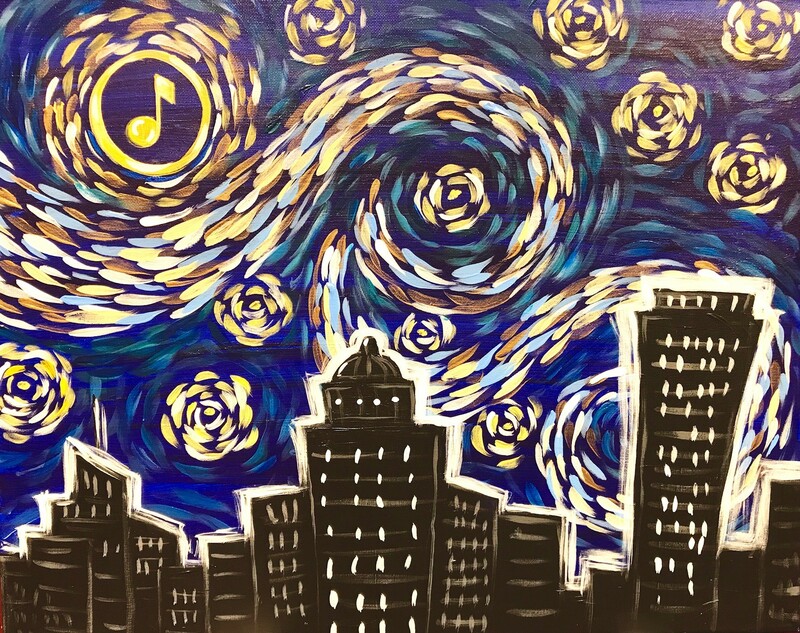 If Vincent Van Gogh painted the Buffalo skyline, we think it would look something like this! Come help Music Is Art at their fundraiser! Inspired by the first snow of the season. This adorable Bunny is sure to brighten up anyone's day. Perfect for Spring, Easter, or a baby's room! Little Brushes Drop Off Camp! Leave the city lights behind and uncover a hidden land with a front-row view of the edge of our galaxy. This cute little stegosaurus is fun to paint and perfect for the dinosaur enthusiast! Stegosaurus lived during the Jurassic period and their fossils were discovered in Colorado.